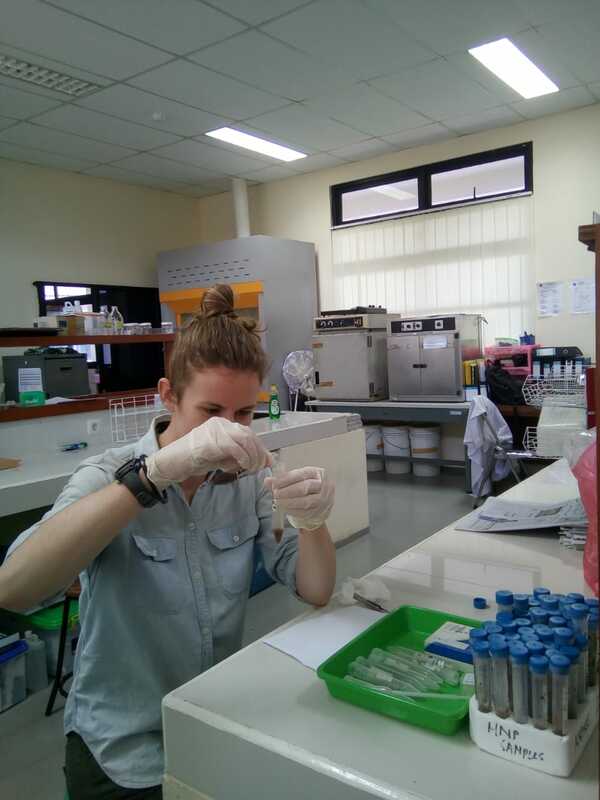 One small part of our project this year is collecting poop samples from a few of the crested macaque mothers (and control poop samples from other females) to check out their health. 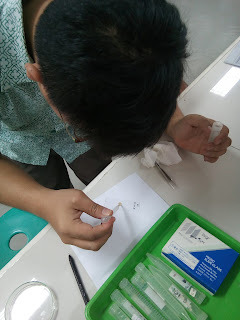 We want to see the total number of parasites per sample and the types of parasites per sample, which we can identify to the genus level. 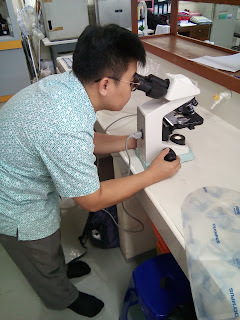 Now I’ve never done parasite analysis before, but Andre Pasetha (my PhD student counterpart) is an expert, so I’ve come to IPB in Bogor for one week for Andre to show me how it’s done. Step One: Collect your monkey poop. With a small stick, scoop the end of the poop into the tube. 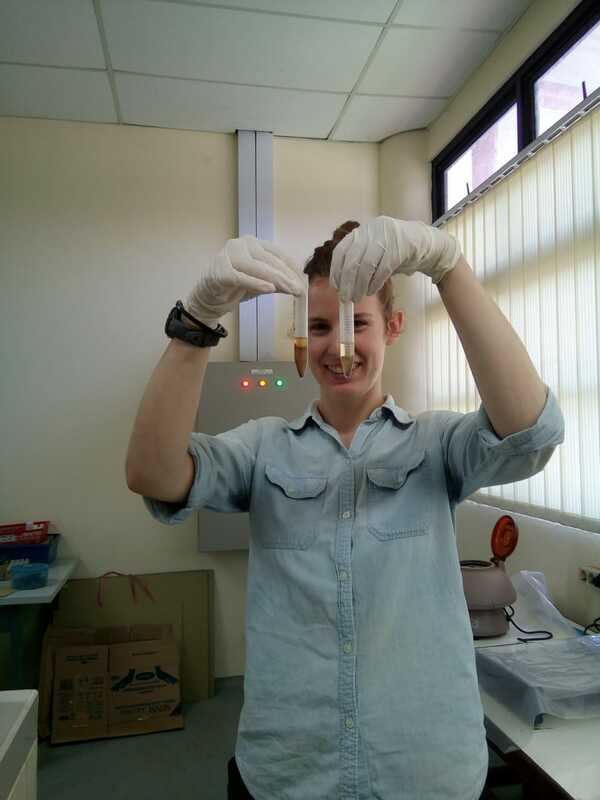 There are different methods of preserving the poop, depending on how you want to analyse the parasites. Since we’re only counting them and identifying to genus, we can preserve them in formalin, but if you want them to survive so you can grow a culture, you need a different way of storing them. 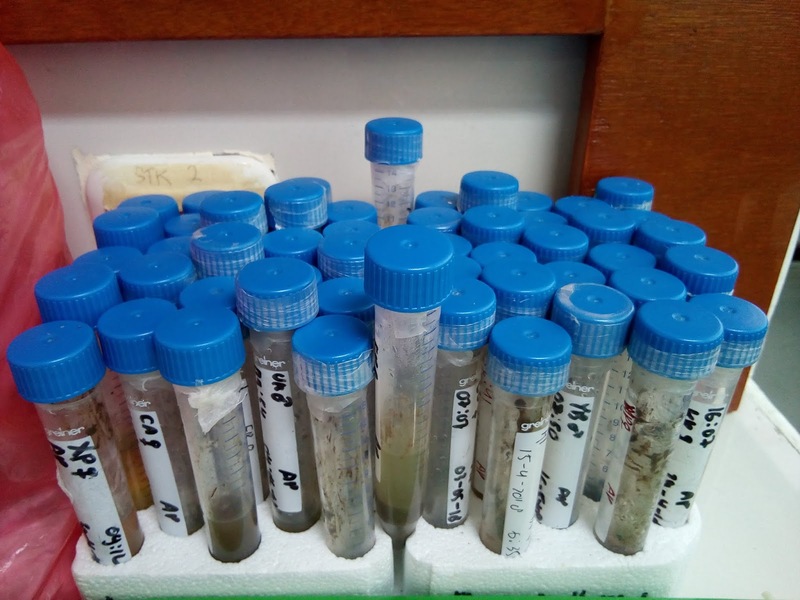 All of our Sulawesi crested macaque poop sample tubes ready for analysis. 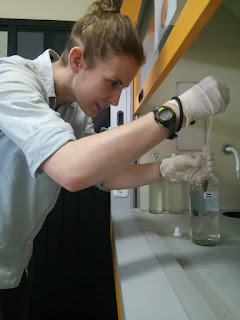 Step Two: Top up the tube with formalin and shake it up to homogenise it a bit. I missed this part of the process, but Andre said you need to stir it around with a stick as well as shaking, to make sure everything breaks apart. Step Three: Pour 3ml of your now liquid poop sample into another new tube. Pour through a filter, or pour slowly enough that you don’t get any seeds into the new tube. Pouring part of the sample into a new tube. Step Four: Add 2ml of ethyl acetate to the 3ml of poop. This is going to help separate out the parts that we want went we shake up the tube. First shake the tube manually and then go find some shaking machines! 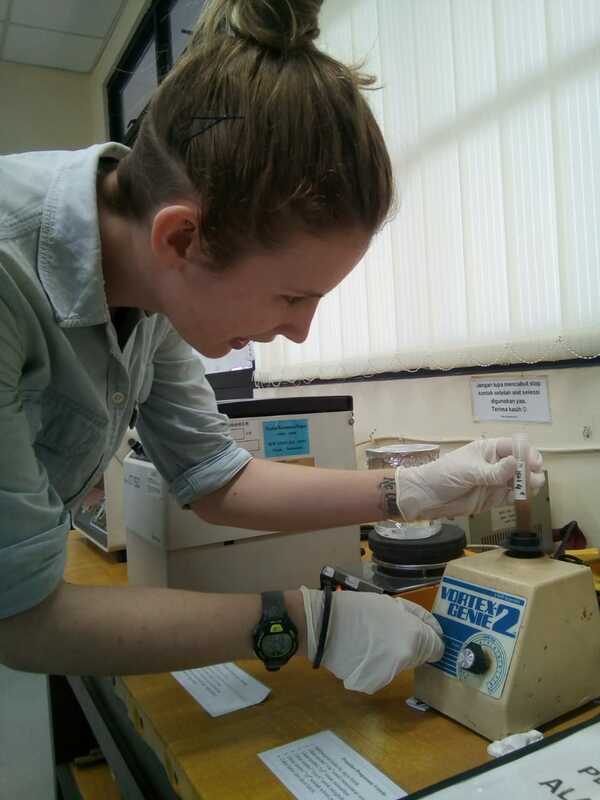 Using a pipette to add ethyl acetate to the sample. Step Five: Hold the tube against this fancy shaking machine, a.k.a. the "Vortex Genie", to do a better job of shaking up the sample. Step Six: CENTRIFUGE!! 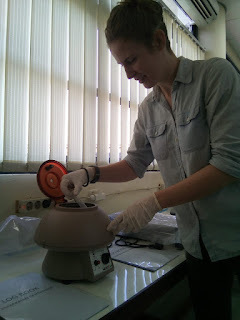 Put the tube (or multiple tubes if you’ve been preparing them all at the same time) into the centrifuge for 3 minutes. This should be long enough for the sample to separate and look a little like the picture below. Putting the sample tube into the centrifuge. Two sample tubes after the centrifuge. Step Seven: With a pipette, take the liquid near the bottom of the tube and squeeze a drop onto your microscope slide. Cover the drop with a coverslip, and you’re ready to look for poop critters! Andre pipettes a drop of the sample onto a microscope slide. Step Eight: MICROSCOPE TIME! 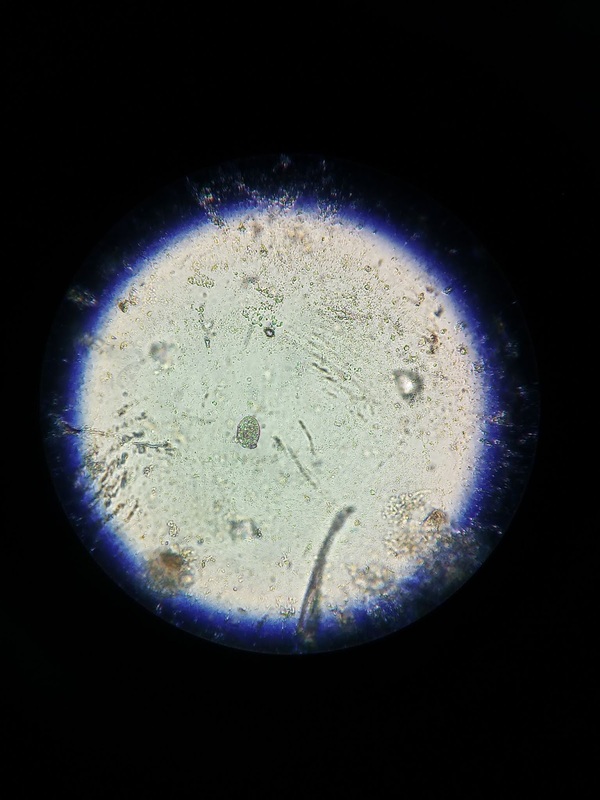 Put the slide under the microscope and look for little parasites and protozoa lurking in your monkey poop. We have a couple of different microscopes here – the standard microscope that most people recognise from biology class, and another microscope that’s hooked up to a computer through “OptiScope” - a camera and software that projects the image from the microscope onto the computer screen. That oval just left of centre is a Barantidium coli! Today, I was just learning how to get to this point in the process. Next, Andre will be looking through all of these slides to count and identify the parasites. I asked him how he keeps track of all the parasites, and he said that he’s actually going to be using microscopes in another lab where he'll set up the microscope slide and coverslip with a grid so that he can count the number of poop critters in each grid square. In today’s samples we found Balantidium coli – commonly found in macaque poop. It's been fun learning a new technique that's such a departure from my normal research, and I’ll keep you posted on Twitter if we find anything super weird and exciting! 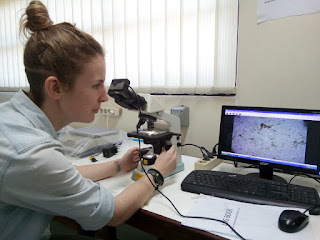 Looking for parasites on a computer screen through the OptiScope. As a PhD student, I was paid to do research but was still a student. Being a postdoc is just on the other side of that professional line, where I still do research and get paid but I’m no longer a student, although what I actually do from day to day hasn’t changed that much. Still a lot of planning research, conducting research, attending talks, reading articles. And although my work hasn’t changed much, actually because my work hasn’t changed much, I’ve gotten much better at it! My PhD was my own project, and while my supervisor gave excellent guidance, I decided a lot of things and ran the research largely independently. Now my Postdoc position is in a bigger research group made up of 1 PI, 2 postdocs (although 1 hasn’t started yet), and 3 PhDs. It’s pretty exciting to have that new teamwork experience. 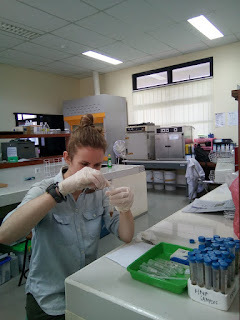 Working in a team might eventually present challenges, but for the moment it’s fun to figure out how we can all divide the work that needs doing before we start the study and then how to coordinate our identical methods across 3 species and 4 study groups. So far, we’re doing a good job at communicating with one another, and that’s going to be key as the project progresses. One of the trickier parts of starting a postdoc is finding time to finish older projects. I still have two chapters of my PhD thesis to publish. But planning the fun new stuff often takes precedent to finishing those old papers. This is totally something that I need to just make time for – in fact, I’ve found that blocking out a day for “Paper x” is the best way to ensure I work on it. And then making sure that once coauthors respond with their comments, that I schedule another day to work on the paper. There’s a lot of planning and discipline that goes into navigating a postdoc.. I recently introduced a friend to the phrase "it's like herding cats". It was in reference to trying to get PhD students to all show up to the same place at the same time (LOL), but I sometimes think about my multiple projects as cats that need herding too. I started my postdoc in July and the middle of the summer is a tricky time to meet people. Once term started and all of the PhD students were having their welcome events, it was much easier to piggy back into the Early Career Researcher group. But it’s still been hard to find other postdocs. For some reason, we’re just not a very visible group in the department. No-one that I’ve asked has known the exact number of postdocs, but estimate around 20-30. I think I’ve met about 7. That’s fine though, because the inbetweeny postdoc stage has allowed me to meet PhD and staff and faculty friends. It would just be nice for future postdocs if there was a better way of welcoming and inviting them to events. Maybe that’s something for me to work on. All in all, I’ve enjoyed these first few months. Some days are really hectic and there are a lot of things to organise. But it’s a really fun job and I do love organising, so that’s not too much of a hardship. And the best part of being a postdoc is that I don’t have a thesis looming at the end of this contract. Just a lot of papers! [Disclaimer #2] I started this blog post and Twitter poll on Tuesday morning and in the afternoon was hit with some pretty heavy family stuff, which compounded all the feels. And now I’m writing it with all that in mind. Academics, and Early Career Researchers in particular, often have to move to follow jobs and fieldwork, and attempt to solve the "2 body problem" (finding a place for self and partner). Half the people that answered my poll had moved 2-5 times in the last 10 years, and a quarter moved more than 5 times. I was counting the times I'd moved to a different town or country but found that lots of people had the experience of moving within the same town because of temporary contracts (and I'd moved within St Andrews too, because of fieldwork). The logistics of moving can be stressful in and of themselves, and having the uncertainty of those temporary contracts forcing you to move sounds horrible! I know ppl in back to back temporary contracts who've had to move between rented accom over and over in same town. The actual goddamn moving while being too poor to hire movers. There's also the point that while you might not move house, moving university and commuting can be really hard - like having two separate lives, going on (1) where you live and (2) where you work. I say other is the hardest part because while you haven't moved your life isn't based in once place. You are pulled by both. Next, I asked people what the hardest part of moving was. 63% said that making friends was the hardest part. But 14% said "Nothing, I love moving!" which is also important to acknowledge. While my own experience is one of "Oh no, I had such great friends and now I have to work really hard to find people that amazing", plenty of people enjoy the process of making friends. And that's really cool! I don't know if there was a hardest part. I've moved so often that it's become routine. Holly's comment really struck a chord - "it's missing the old stuff". I think I can do moving and settling into a physical space, but I really miss the old friendships that I left behind. And making new friends was clearly something that lots of people struggle with. So what does the university do to help introduce newcomers? I was pretty shocked that 65% of respondents hadn't been introduced to people through their university's induction process. Luckily, when I arrived at York I was led around offices and introduced to a few people (who later introduced me to more people etc.) It was really helpful!! This is something that all universities should do in one way or another. York Psych department very welcoming and friendly. If some universities aren't doing much to help newcomers integrate, are people in the department taking it upon themselves? These numbers look a bit better, with 2/3rds of people being invited to social events personally or by email (I think that personal invites are more effective; sometimes I shy away from an e-invite if I don't think I'll know anyone there). But that's still 1/3 of people not being invited to departmental social events. I wondered whether people had personal strategies for dealing with moving to a new place. Okay, it was quite mean getting to choose between these three options, because I actually do all of them (also physio and massage is wonderful!) But having forced a choice, 50% of people find nesting into their new home helps and 36% like joining clubs, gyms, teams etc. Joining clubs and things is a good way of meeting people outside of the department, and my final question was "in the end, where were most of your new friends?" It's not massively surprising that most people make most of their friends within the department. I'd be really curious to see how this demographic changes the longer you live somewhere. Whether it would start to shift towards people outside the department and university as you met people in different ways. So, yeah, my difficulties moving this time have probably been really affected by personal stuff that's going on simultaneously (when it rains, it pours - am I right?) However, it sounds like a lot of people find it hard to make friends at first, and there's not always the university or departmental structures in place to include newcomers. I've been pretty lucky coming to York, and it would be great if, in a career where so many people have to move so regularly, there were more standard procedures across academia for welcoming people. As some of you know, Cat Hobaiter and I are putting together an online experiment to test human understanding of great ape gestures. This means pulling together video examples of all of our gestures, but we need to make sure that the gestures will be visible for everyone. Cat and I (and many of our colleagues) are used to looking past branches, with shaky cameras and digitally brightened videos. We are going to pick the clearest videos possible for the experiment, but I'm curious - how well can you spot a gesture? Does it matter if the camera is shaky? Does it matter if the angle is from underneath? Does it matter if branches are in the way? Do the branches matter less if the movement is bigger? Were any of those gestures impossible to spot? Which condition was the hardest? After I hyped up the viewing difficulty at the top of this post, was it easier or harder than you expected to spot the gesture? We are aiming to have the full experiment online by July, so WATCH THIS SPACE. We are also creating a website to host video examples of each gesture type for both bonobos and chimpanzees, so that you can finally actually see what the different gestures look like. It's been a change of pace since December, a different kind of "fieldwork". I'm working at the Primate Research Institute in Inuyama, Japan. The team at PRI have been filming wild chimpanzees at Bossou, Republic of Guinea, for the last 30 years. The video was used shortly after filming, by watching through a TV and coding directly. But most of the video is on tapes! VHS, Hi8, DV, even Betacam. Now we're working on a project to digitize all of the tapes, saving them to hard drives. Digitizing the video will make it easier for future researchers to re-watch and code data through a computer. It will also protect the video footage. I didn't realise before, but VHS can go mouldy! Digitizing the tapes quickly should ensure that none of the video is lost. This is a pretty big project, and many more people will continue to digitize after I leave. And the Bossou video isn't the only video that needs digitizing - so many universities and organisations have their own sets of tapes in the basement. I've made several videos to show how to use the digitizing system here at the Primate Research Institute: VHS, Hi8, and DV. It was fun Googling how to set everything up, but why put everyone else through the rigmarole?